Air Force’s leading rusher, Cody Getz, aggravated his left ankle injury on the first play of the game and didn’t return. Air Force allowed New Mexico junior Kasey Carrier to rack up 338 yards on the ground and three touchdowns. No Air Force running back topped 100 yards, and the Falcons’ leading rusher, junior Ty MacArthur, plays wide receiver. New Mexico jumped out to a 10-0 lead before the halfway point of the first quarter. 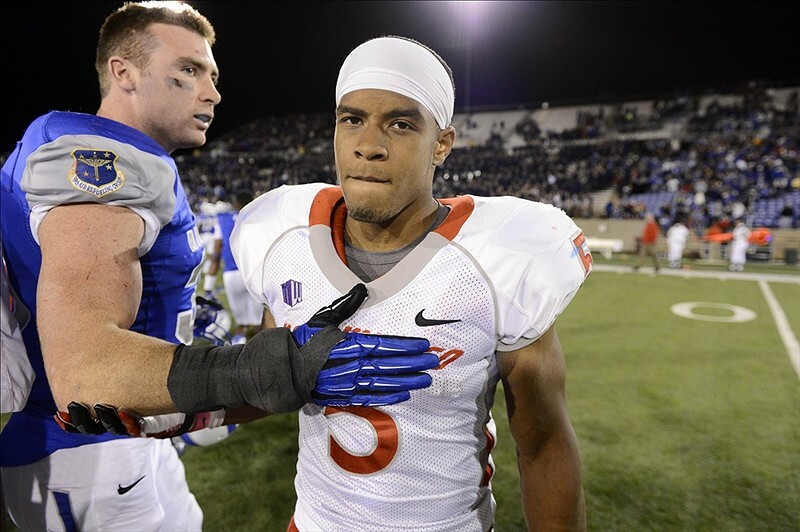 … And despite all that, the Falcons earned a 28-23 win to improve to 4-3 on the year (3-1 Mountain West Conference). How does a team overcome a 338-yard rushing performance? First, rally behind running back Wes Cobb, who shouldered the offensive workload with a 17-carry, 82-yard, three-touchdown effort (MacArthur sprinted to 94 yards on just seven carries). Second, get some timely defense from senior linebacker Alex Means, who wrapped up Lobos running back Lamaar Thomas on a critical fourth down with about four minutes to play. Third? Well, a little luck never killed anybody: Means picked off a B.R. Holbrook pass in the second quarter and returned it 65 yards for a touchdown, admitting to The Associated Press after the game that he’d blown the blitz call on the play and was lucky to arrive in the Lobos’ backfield just a little late. Means’ score and key stop may help Air Force overlook the 338-yard elephant in the room. Carrier’s effort set a new MWC record and places him within two yards of the top 25 rushing performances in Football Bowl Subdivision history, the realm of familiar names like TCU’s LaDainian Tomlinson (best-ever 406 yards vs. UTEP), San Diego State’s Marshall Faulk (386 vs. Pacific), Texas’ Ricky Williams (350 vs. Iowa State), and Georgia Tech’s Eddie Lee Ivery. A quick primer on that last guy: Ivery rushed for 356 yards on Nov. 11, 1978, tied for the 11th-best total ever. He did it on the road. He did it against a team coached by a man who’d go on to win Super Bowls. He did it … against Air Force. And unlike this year’s team, Bill Parcells’ Falcons couldn’t overcome a 300-plus-yard rusher, falling to Georgia Tech 42-21.